At the Wizarding World of Harry Potter at Universal Studios you are transported from Orlando, Florida to a mythical world created from the mind of J.K. Rowling. Everywhere you look you see something new from the book. Whether it’s Hogwarts Castle or Gringotts Bank, Diagon Alley or Ollivanders, when you are there, you cannot escape Harry Potter. It’s a theme park and it’s meant to take you to a place that does not exist but make you believe it’s real. That was T-Mobile Arena today for media day, but instead of Harry Potter, the theme was the Stanley Cup. It was unavoidable. 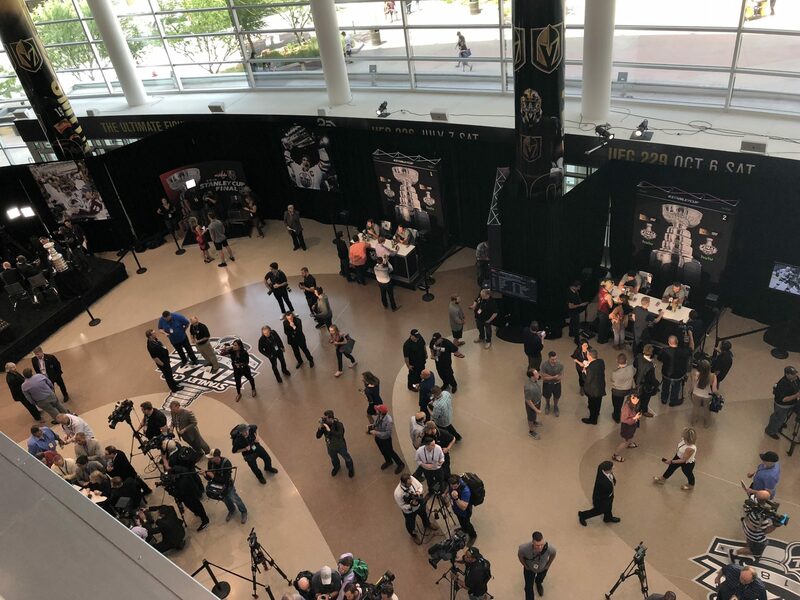 From banners wrapped on buildings to giant stickers on the floor to the actual Cup sitting right there in the main lobby of the arena, it was a Stanley Cup theme park, and every player from both teams had to walk right through it. McNabb said that while wearing a polo shirt with the Cup on his chest, sitting behind the words Stanley Cup Final in front of a backdrop of a giant image of the Cup flanked by pictures of players hoisting the Cup from years past, and to his left was the trophy itself. Right there in the flesh being guarded by two men wearing the signature white gloves and shining so brightly, it would have caught the eye of even the most oblivious attendee. It wasn’t just McNabb, it was every player. Like Harry Potter World though, it’s all a fantasy, at least for now. The whole time, the real Cup is right over there. The intended mindset of everyone involved. Stay focused on the task at hand and the fantasy world will become a reality. But is it even possible when placed in this environment. It’s almost cruel. There’s a symbol that represents everything a hockey player can achieve and before they’ve achieved it, they have to walk through a fantasy land where that symbol is never out of sight. Today, William Karlsson walked through The Wizarding World of Stanley, tomorrow he will play in Game 1 of the Stanley Cup Finals, and sometime in the next two weeks he’ll either have hoisted the Cup or he’ll have been oh so close. Media day is meant to expose the entire world to the people who will participate in the best sporting event on the planet. It does that, but at the cost of constantly flashing the reoccurring dream of every player directly in their faces over and over again. Mental toughness has been a hallmark of the Golden Knights. Nothing seems to get to them, but they’ve never handled anything like this. Luckily, the same goes for the Capitals, and when it comes to handling oddities, I’ll take Vegas over Washington any day.